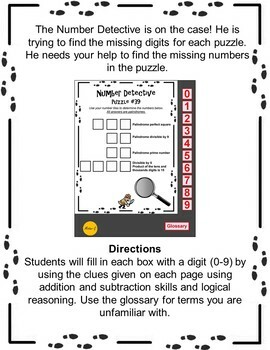 This is the paperless / digital version of: The Number Detective Math Tiles Middle School Pack. The Number Detective is on the case! He is trying to find the missing digits for each puzzle. He needs your help to find the missing number or numbers in the puzzle. 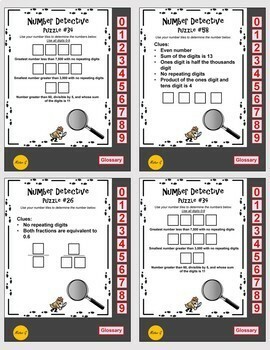 Students will fill in each box with a digit (0-9) by using the clues given on each page using logical reasoning, math terminology, mathematical reasoning and their number sense. This can be used to introduce students to new ideas and concepts or to reinforce understanding. This resource is designed to make the classroom efficient and interactive, and it is presented as Google Slides™, eliminating paper and planning. It can be used on laptops, iPads, Chromebooks, and tablets. The product file is a simple PDF with a link to the Google Slides document where you can copy the resources for your own use. 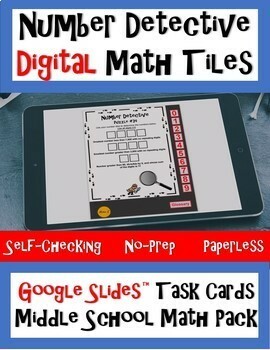 This is a perfect activity for math centers or for students who finish early. 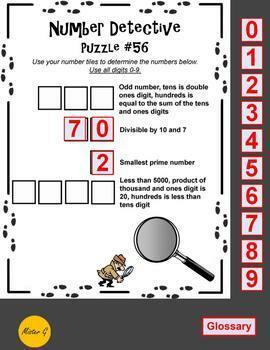 The puzzles vary in terms of difficulty, so it will help students of all levels. It is great for Google Classrooms and schools that utilize 1 to 1 learning!